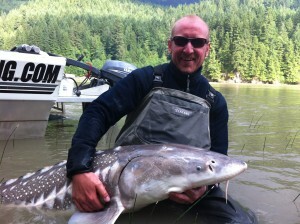 Well the fishing here in the Chilliwack to Vancouver area has continued to keep us excited with many great opportunities. 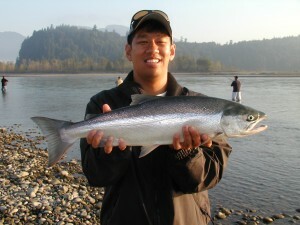 Pitt River Flyfishing at its best! 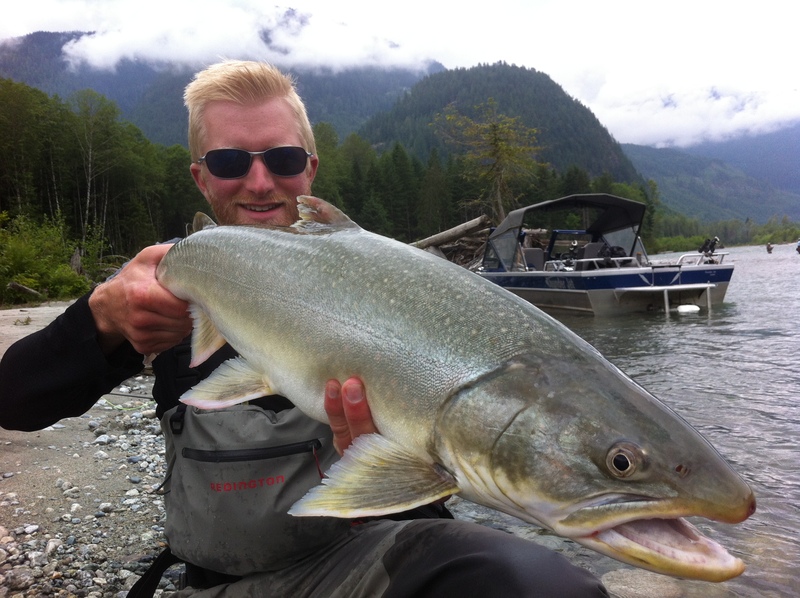 The Upper Pitt River has been smoking hot this past 2 weeks and the Sea Run Dolly’s have been the biggest we have seen in many years. The river has stayed in primo shape and there are so many runs holding good numbers of fly crushing fish. We have also seen more Rainbows around and even caught some Cutty’s too. Now if you have never experienced a trip up this river between now and late July is great timing. The jet boat ride is one of the best you may ever have in your life and all this so close to Vancouver. A great day trip and or for multi-day trips for those anglers looking for the best fly fishing trip of their lives. Our team guides can teach you all the skills needed to hook up and to grow your skill levels. Both single hand fly casters and double hand Spey rods all work well coupled with big intruder fly’s. 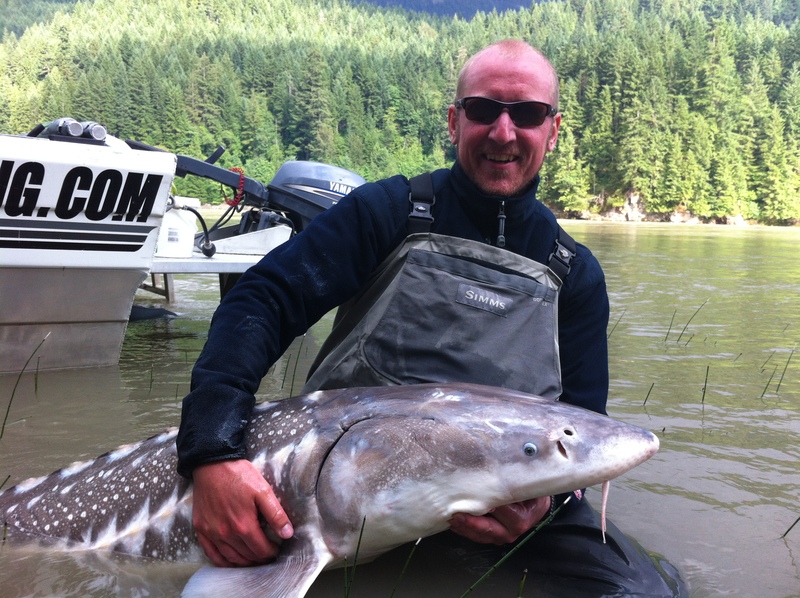 Looking for your next Wilderness adventure – look no more and come with us and see the Upper Pitt River by jet boat. 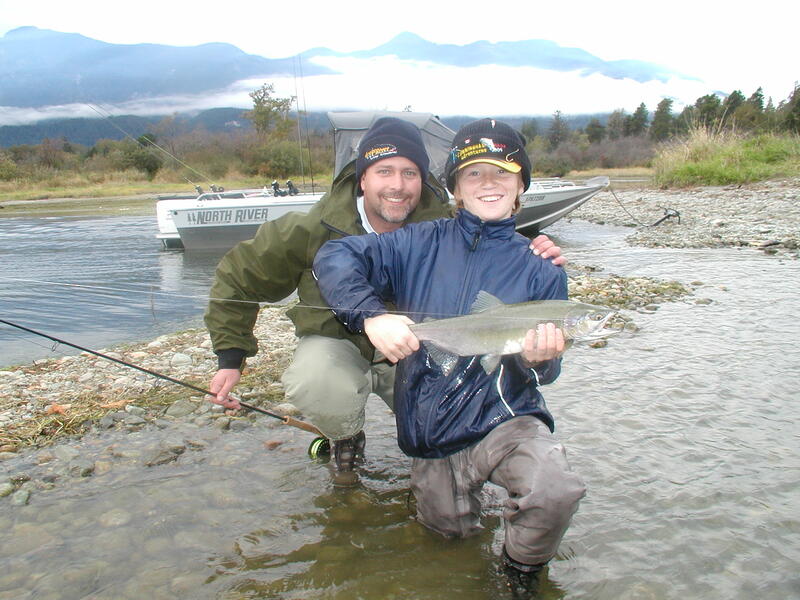 We supply all the fly’s, rods and equipment to make your next fly fishing experience one to remember. Ole with his final fish of the day….Not a bad way to end. afternoon, packing lots of baits seems to be the normal for all of our team guides. Still getting good fish on Eulachon, but Lamprey have been really working well, we are using them in small little rounds and back hooking them. One overlooked bait is dew worms and these have been producing in the shallower area’s we have been targeting. 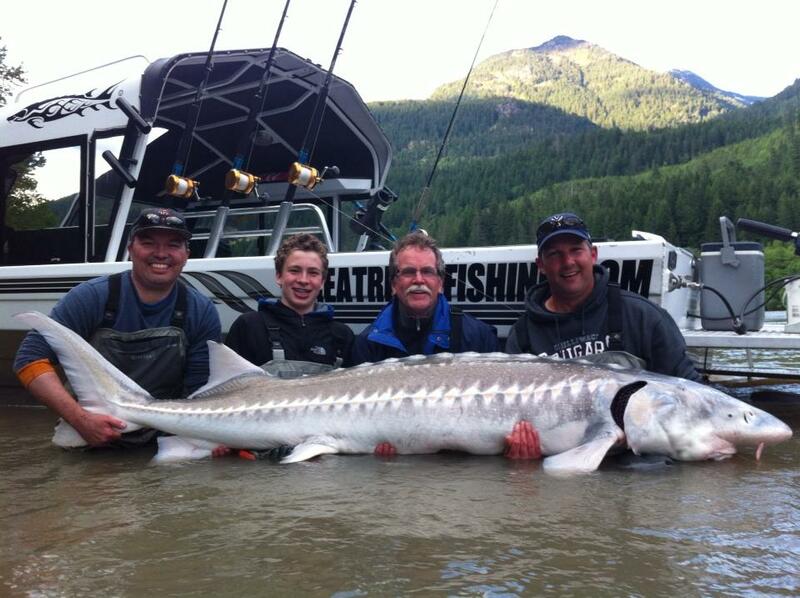 Most anglers think Sturgeon are hanging in that deep water but to tell you the truth we find them big bad boys in lots of shallow water spots. I tell everyone about this and most think I am nuts until they see a giant explode from 6 to 10 feet of water – attitude is not the word, down right mental gear thrashing comes to my mind. 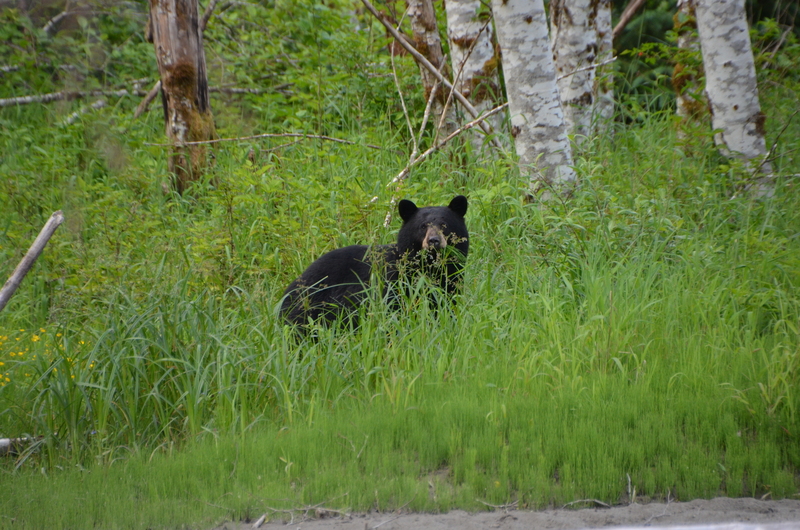 In the reaches around Chilliwack places like Minto Channel, Cattermoles, Carey Channel and side sloughs even like up in Jesperson’s. 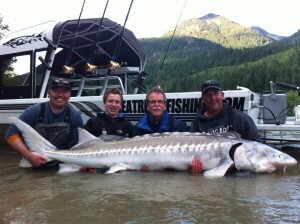 Monty, Derek and Scott showing off this monster! Personally speaking now I really enjoy the Fraser Canyon Experience and looking back now after all the years of guiding here in the Fraser Valley of Beautiful British Columbia this is the place I continue to always get lured back to day after day. Not sure if it is the scenery, the wildlife, the rocky gorge mountains, the fast boiling waters, or the interaction with the First Nations groups. One thing for sure is the fishing and peacefulness seems to meet my place in life today and what I like to share with the clients on my boat. 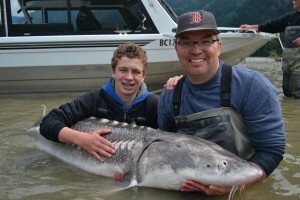 Maybe a bit of all of the above and the moral of the story is if you get a chance to come our way and Sturgeon fish and your are looking for something out of the normal and tranquil, book the Fraser Canyon Experience, you will come away with more than just a day on the river. Now looking to the summer Salmon fishing, things have been a little slow going for the run thus far in the season and we are hopeful that the Fraser River will be opening for retention of Chinook (King) Salmon on July 16thfor a slot size. 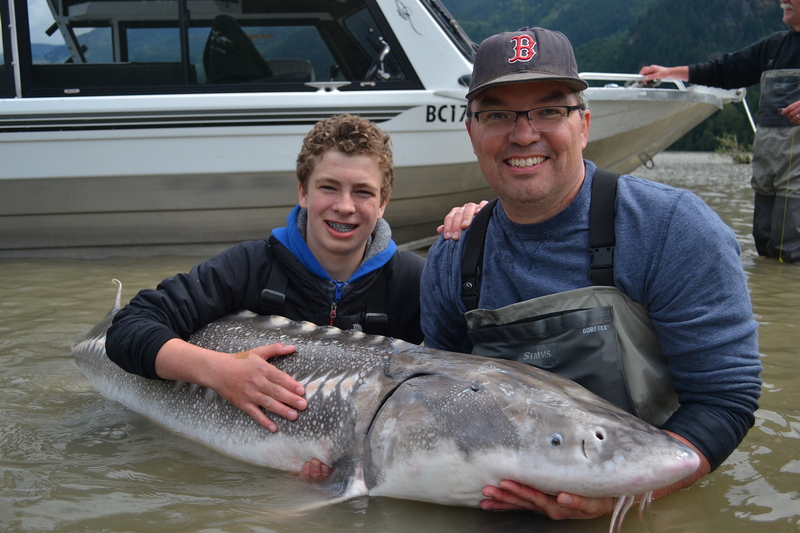 The will be a 1 fish per day limit and once the escapement has been met DFO (Department of Fisheries and Oceans) will be opening the river – August 1 – to all Chinook sizes and the limit will be 4 per day – 1 over 65 cm and 3 under. Now the reasoning for all this again this year is our stock group of these fish have been declining and we are hoping that with a limited fishery for a few years we can make a difference and get this t=run back to a sustainable level for the future. Something truly we should all want. We could have a run size estimate of about 2.6 million Sockeye Salmon and this is based on a management estimate at 25% probability of run size and this run peaks in about mid to late August generally. If the stock group comes back with excess fish then there could be an in season decision to allow a Sport fishery. One thing we know for sure is for the 2014 season we should easily see an open Sockeye fishery with a potential 30 or more million fish potentially to return it will be a super run. Looking forward in early September we will have the Pink Salmon run and the sport fishing community should get a good fishing opportunity on the potential 15 or more million fish. Now this is probably the best fishery in the world for including family and new comers to the sport of fishing. Along with the Pink Salmon come the Interior Coho Salmon which is a stock of fish that has been under the microscope for the past 10 years. There has been DFO management measures that protected this run called a “Red Zone” for about 6 weeks starting early September and now the stock has rebounded to a level that could see a new targeted fishery again. Kudos to all of us for doing the right thing. 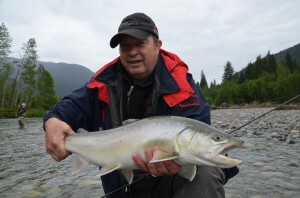 There is the South Thompson run of Chinook Salmon that come in late August and runs until about the end of October and peaks in mid September to the first two weeks of October, hopefully this run will be a strong one in 2013. I guess the real moral of the story here is we have enough fish migrating in the Fraser River that supports some of the best fishing experience potential in the entire world. If you are looking for that experience then come join our team of professional guides that are simply the most passionate amazing teaching instructors that want you to take away something truly special – that trip of a lifetime. We all want to create “Raving Fans” and to have you talking about us and spreading the word of what Chilliwack, near Vancouver British Columbia has to offer. Someone came out to check things out. Plan to head out to Cultus Lake on Saturday, June 15 for the 2013 Cultus Lake Pikeminnow Derby. It’s the day before Father’s Day — a perfect time to gather for family fishing fun, delicious food and community celebration. The boat launches will be open, or you can fish from the shore. Remember to bring your own tackle! The event gets underway at 6:00 am, and parking is free if you arrive before 9:00 am. 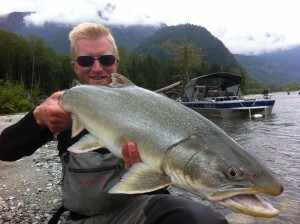 By entering the Derby, you’ll be helping to control the number of pikeminnow, a predatory species in Cultus Lake. That’s a big help to salmon and other fish in the lake. No fishing licence is required to catch pikeminnow if you’re entered in the Derby – and it’s one day only!